Hot off the presses from Boston, MA. This is a real news story not a hoax. Arrests came swiftly for two people accused of beating a popular Boston street performer and attacking him with a knife. Keytar Bear, a busker known for--yes--wearing a bear suit and playing an electric keytar, said he was performing for a crowd near Faneuil Hall Tuesday night when the attack occurred. Boston Magazine reports BPD identified suspects using video surveillance, Wednesday, and arrested two of them the same day after a "brief encounter." BPD didn't release the names of the alleged assailants. In a Facebook post that followed the alleged incident, Keytar Bear described how "2 guys and a girl" attacked him and "stole" from him. 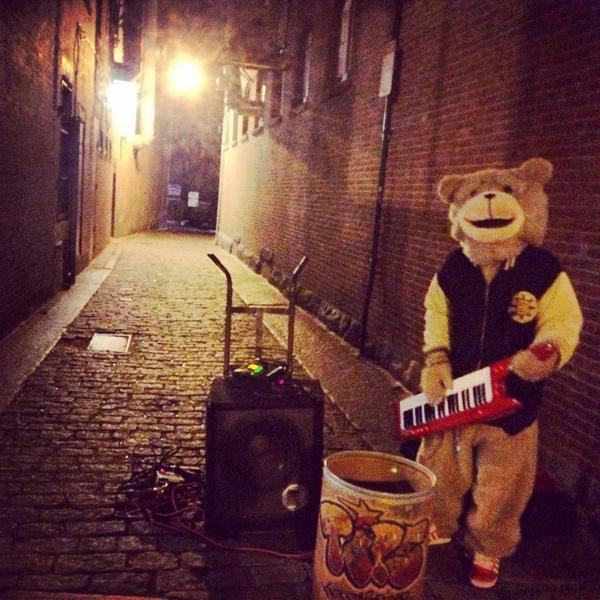 A police report cited by Boston Magazine described how a white female, age 20 to 26, took money out of Keytar Bear's tip cup, precipitating the fight, which ended with three of her male companions holding down Keytar Bear while the woman punched him repeatedly. In his Facebook post, the musician mentioned a knife attack. That wasn't in the police report, according to Boston Magazine. A day prior to the arrest, police responded to a call for an unarmed robbery near Congress and North Streets, where Keytar Bear was playing his instrument outside. It wasn't the first incident of an alleged assault on Keytar Bear. The performer allegedly took a similar beating in a similar location back in May, leading to an Indiegogo campaign to raise money for his broken keytar and injuries. That led to a fundraising concert at the Middle East nightclub ($6,000) and a Cambridge city councilor declaring May 8 "Keytar Bear Day." What new chapter will this latest incident bring?